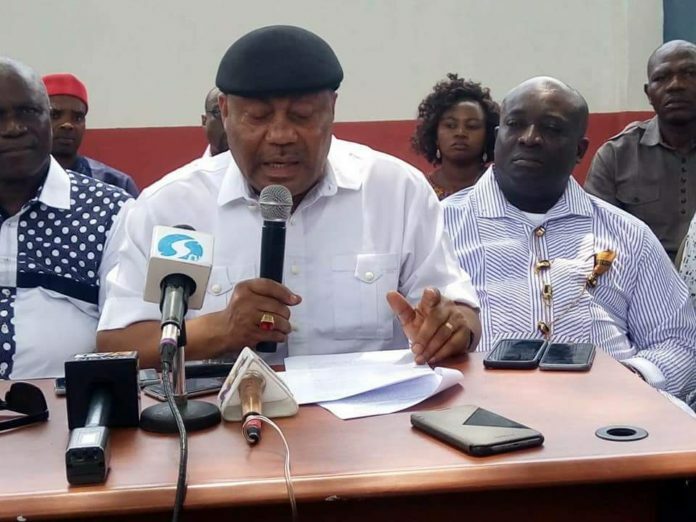 The immediate past Rivers State All Progressives Congress (APC) Chairman – Chief (Dr) Ibiamu Davies Ikanya who relinquished his office on 21st May, 2018 before the commencement of the State Congresses of the party to pave way for the formal election of Hon. Ojukaye Flag-Amachree as the new Rivers State helmsman has described the event that led to the election of Hon. Ojukaye as a turning point not only in APC but in Rivers State as a whole. Chief (Dr) Ibiamu Davies Ikanya who congratulated the new Chairman, described him as the divine tool in God’s Hands to restore hope to the people of Rivers State after the traumatic and wasted four years of the devilish regime of Governor Nyesome Wike. “Having observed and worked with Ojukaye for quite some years, I am convinced that he will bring the needed energy, dynamism, vigour, sagacity and vision to bear on our collective struggle to make Rivers State the desired and destination State as envisioned by the founding fathers of the State” Ikanya said. Dr Ikanya who took time to commend and thank the party’s leader in the South -South region, Rt. Hon. Chibuike Rotimi Amaechi the Minister of Transportation, Dr Dakuku Peterside the DG NIMASA, other party leaders and members for granting him the opportunity to serve the State in this capacity for the past four years and reassured all the party faithful of his unalloyed loyalty and push to enable the party achieve our common goal in Rivers State. The erstwhile party boss described Amaechi as a true democrat who is ahead of his time, a true Lion and hero whose political sagacity and wisdom saw us through this period of turbulent, unpredictable and unprecedented political challenges. His inputs during this period of our political history have exposed him as a leader in the mould of Zik ,Awo, Sir Abubakar Tafawa Balewa, Sir Ahamdu Bello and of course Aminu Kano. If he continues in this zeal and sagacity, I am convinced that his services will restore hope to our nation. He urged all members of the party to unite under the great leadership of Rt. Hon. Chibuike Rotimi Amaechi so that collectively we can reclaim the Brick House come 2019. He urges Ojukaye to build a more vibrant, cohesive and united party that will restore hope to Rivers State people. Dr Ikanya vilified Governor Wike for claiming that the Federal Government is plotting to assassinate him, describing the claim as not only “baseless, childish but a claim coming from a very decayed and diseased mind that needs our collective prayers. Wike I must state is suffering from hallucination based on the torture he receives from the ghosts of those APC members he engineered their killings and fearing that these ghosts may revenge their killings but linking his unstable mind and sad situation to the Federal government is an act that is regrettable”. He counselled Governor Wike to pipe down and renegotiate his exist peacefully and avoid further tarnishing of the good image of Rivers State and her people. On the other hand, the new Rivers State APC Chairman, Hon. Ojukaye Flag-Amachree desrcibed his predecessor, Dr Davies Ibimau Ikanya as a trailblazer whose inputs at the formation and sustainability of APC in Rivers State is a great challenge to him but assured all and sundry that he will not only improve on some of the feats of Dr Ikanya but will make the taking over of the Brick House come 2019 a reality unfailingly. He thanked God, the Leader of the party in the South-South, Rt. Hon. chibuike Rotimi Amaechi, the delegates for granting him and his Team this opportunity to contribute their own quota towards building a virile, vibrant and great party that all Nigerians will be proud of.